How would you like a significantly faster punch in just one week? You can practice this technique on your own. It’s easy, and it works. If you are going to try this drill for training speed, then please give it its chance. Try it for one week, and then assess how much improvement you have made. I would love to be able to say that this exercise was handed down from generation to generation. Or that Bruce Lee taught my teacher, and my teacher taught me. To be frank, I invented this exercise when there was a period that my punches … sucked. They were terrible. It was one year, when my garage classes sort of fell apart. Not that I am blaming any students. We were all busy, so classes stopped. And I stopped punching. This hiatus lasted through the summer, as well. And when I finally returned to punching … in October, my punches were slow, and wobbly. I am not kidding — each punch wavered and couldn’t seem to find a precise target. My punches were pitifully slow. I needed to get my punches precise and fast, and I didn’t want to take years to do it. I gave myself a week, which, because I liked the exercise so much, extended to almost a month. Here’s the exercise that I developed…. As an example, let’s improve our back fist (sometimes called a back knuckle) punch. I want you to think about sneaking spare moments to practice. Actually, you will practice for only a few seconds at a time. The practice session goes through a progression, by day. The first day, you’ll punch one way. Then you’ll change it for the second day. And again on the third. And so on. For this drill, you will punch hundreds, if not thousands of times during the day. But only a few punches at a time. Every time you are alone, out of sight of everyone else, whip off a few punches. Do this all day long, for seven days. Walking down the hall by yourself at work? Punch five times. Actually, five back fists will be 20 punches in this exercise. 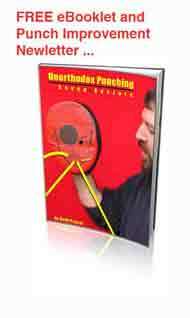 Here’s how to punch…. Perform three slow back fists. Make them even slower than half speed. Got it? Three slow back fists, one right after the other. As you finish the path of the third punch, get ready. As soon as it ends, snap out the fastest back fist you can imagine. Try to keep it on the same path as the slow punches, but don’t worry too much. Go for speed. One punch – fast. Do this all day long, for two days in a row. On the third day, change it. Spend one day of punching twice slowly, and then once fast. Always with the same punch. In this case, the back fist. On the fourth day, you will punch slowly once, and then quickly once. All day long. Hundreds of repetitions. On day five, you will spend the entire day speed punching. Only one punch at a time. But all day long. When you get a spare moment, you will throw out one super-fast punch. Pause. Then another. Pause, pause, pause. Then another. Vary the wait time, in between. Do this same pattern on day six, as well. Then, for your last day — day seven — you will perform the slow punch(es) after your fast one. It’s your choice whether you want to follow your fast punch with one, two, or three slow ones. Do what feels comfortable. Try training your brain and your muscles this way for one week. I think you will be pleased with the results.